Existentialism is an area of thought or study related to concerns about existence. Most of us will at some time in our lives reflect on questions about what it means to be human. These might include: What is the meaning or purpose of this life? If we all just die anyway, how can there be a point to it all? How am I to live a 'good' life? On some level, we are all existentialists. As humans, we have the unique capacity to think about abstract concepts and think in terms of time and space. As a species, these capabilities have helped us to survive and to thrive, but like an unfortunate side effect, they also enable us to reflect on our own mortality and provoke questions related to our very existence. Regardless of whether or not one believes in a spiritual afterlife, when we die, it is an end to this life. With this awareness, a tension begins to arise between our knowing that death is inevitable and our wish to continue living. All animals have an instinct to survive and humans are no different. To a certain extent, an ongoing awareness of our mortality can be helpful in that it reminds us to not waste the time that we have and to live each day with purpose and vitality. However, if one cannot tame the anxiety that comes with this awareness, one may be overcome with a sense of panic or what is sometimes called 'death anxiety.' At the other extreme is a person who never thinks about death, which can be just as problematic if it robs us of a deeper sense of importance, vitality, and meaning. Unfortunately, people living in this extreme are rarely aware of a different way to live, though life itself can sometimes shake things up by 'reminding us' of our own mortality. Most often, this will happen when we experience the death of a loved one or when we encounter a significant life milestone or transition. Death is something rarely talked about because of the anxiety that it naturally evokes in all humans. 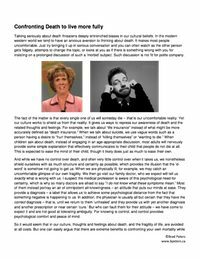 Therapists are not immune to this effect, and it would not be uncommon for a therapist to unknowingly evade uncomfortable discussions about death and focus instead on a 'symptom' (i.e. depression or anxiety), or if all else failed, encourage a client to seek spiritual or religious counselling. From my perspective, avoidance may only exacerbate the problem and can leave a person feeling more alone in their thoughts and feelings. In my therapy sessions, I make every effort to explore these questions with clients wanting to do so, and to inquire about them if I believe they might be related to the problem or symptom for which the individual is seeking help. We typically see freedom as a good thing, and at least in the Western world, we believe ourselves to have a great abundance of it. But being truly free in the absolute sense and having the power and autonomy to choose our life course comes at a price. Where there is choice and independent action there is responsibility. For many of us, being aware of an absolute freedom can become a burden if it opens our eyes to the countless choices and actions we might be responsible for. Therefore many of us unwittingly conspire against ourselves, along with our governments, cultures, and family myths or values, to limit our perception of freedom. It is easier to believe that we have a prescribed direction and course in life; it provides structure, routine, and safety, and relieves us of personal responsibility for our lives. From an existential perspective, the problem of 'freedom' is represented by this tension between our confrontation with groundlessness (freedom) and our wish for stability and structure. If we can learn to be more aware of this tension, we can learn how to balance the two. This line of thinking is also related to the idea that perception is subjective and therefore open to multiple points of interpretation. If we apply this idea to human relationships, it means that we can never truly know another person in the most absolute sense. We cannot know, for example, that one person's concept of 'love' means the same as another. While we might have clumsy words to describe a feeling or thought, we can never experience what it is truly like from the perspective of another. In this philosophical sense, we are existentially alone in the world. As hard as we might try to connect with another person, there will always be gaps and misunderstandings in our communications and experiences. A tension then arises between our awareness of this isolation and our wish for contact, for protection, and our wish to be part of a larger whole. If we can be aware of this tension, we can learn to tolerate the fear and loneliness of our existential isolation. Instead of pulling away from other people to avoid the uncertainty or risk of being hurt, we can push ourselves to be authentic and genuine in our relationships. On some level, we all seek meaning in our lives. A sense of meaning makes existence bearable. It gives us a sense of importance, value, or purpose. It can make us feel like there is a point to our day-to-day lives. The problem, from an existential perspective, is that we are meaning-hungry creatures thrown into a world that has no clearly defined prescription for satisfying this need. Some believe that there is a set meaning or purpose in the world and our task is to simply find it. Others believe each of us is responsible for creating that meaning for ourselves. I believe that whatever path one takes, the process of asking the questions is a healthy one, and in a therapy session I make myself available to explore these ideas and questions with clients wanting to do so. It is important for me to point out that an existential approach to therapy is not a 'stand alone' mode of treatment, though I integrate these ideas into my therapeutic approach and draw from them if I believe it will be helpful to my clients or if a client wants to make any of these issues an explicit focus of therapy. While it is obvious that some of these difficult topics do not have easy answers, the process of asking the questions and the stand one takes toward them can be healing. As a quote from an unknown writer states: 'My mind is like a bad neighbourhood, I try not to go there alone.' I believe it is the responsibility of any good clinician to ensure that their clients or patients do not have to go to these difficult places alone. Harry Haller is a lonely middle-aged man who craves human contact while despising much of humankind. In seeking an end to his suffering, he contemplates suicide, but along the way he meets several characters that take him on an existential and experiential journey that change him in profound ways. Steppenwolf is a deep and moving novel about existential isolation and meaninglessness, the ultimate futility of intellectualization, and life/death. While it has no obvious 'happy ending,' it manages to evoke a kind of relative hope that arises from seeing the humor in life and learning to laugh in the face of tragedy and despair. Hesse reminds the reader that it is gallows humor, but perhaps that, combined with real human contact, is enough to sustain a life. In his book, Staring at the Sun, Yalom provides consultation and guidance for the individual consumed with overwhelming thoughts and feelings about their own mortality. While Yalom asserts that everyone has some level of 'death anxiety,' certain individuals may find themselves crippled by it. From a secular perspective, and drawing upon decades of experience as an existential psychiatrist, Yalom provides insights and illustrations to assist the reader in confront their own mortality while managing the anxiety it elicits. This is a highly recommended read for all thinking persons. 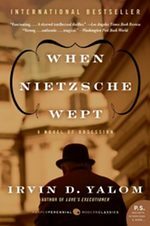 When Nietzsche Wept is a story involving a fictional encounter between the nineteenth century philosopher Friedrich Nietzsche, and one of the early founders of psychodynamic therapy, Josef Breuer. Dr. Breuer is tasked with treating Nietzsche for his migraine headaches and bouts of despair. But Breuer has his own demons and before long, one wonders who is treating who? This is a story that touches on issues related to life, death, love, obsession, meaning, and freedom. Yalom does an excellent job and presenting some of these 'existential' themes to the lay reader who may be unfamiliar with some of the philosophical concepts. It is both moving and enlightening. Dr. Frankl has moved millions of readers in this memoir reflecting on his personal experiences within the Nazi concentration camps and the lessons to be learned about life, loss, the human spirit, and the will to survive. All human beings, he argues, must cope with some form of suffering but in order to do so, one must find some sense of meaning in it, and move forward with a sense of purpose. This has led Frankl to develop what what he called 'logotherapy,' a theory and therapeutic approach that emphasized the discovery and pursuit of what we personally find meaningful. This book has sold over 10 million copies, and it is not hard to see why; it is hard not to be moved in some way by what Frankl has experienced and what wisdom he has to share.